Here I am sitting in a tiny, cute-as-a-button coffee house in Portland while Josh is hard at work (cool logo/branding too - makes me think of Scrubs ostriches). He's taking an ethics exam that's necessary for lawyers in a some states. Washington doesn't need it, but neighboring Oregon and also California do require it...really it's just in case dash who knows where we'll end up safety. So, while he is busy taking the exam, I'm out exploring. Exploring is a favorite pastime of mine (aka roaming). I love walking around new areas and finding awesome places such as this coffee house on Alberta Street called Random Order. I ended up on Alberta Street, after roaming around the University of Portland (where Josh has the exam). I took a few shots of cherry blossom trees as well as some nice river views. It's a pretty school. At least, as cool and neat as schools go, but only 20 minutes of exploration is really necessary. Now we transition to...Alberta. To be perfectly honest, I've been in this area previously. In other words, I'm not exploring a entirely new area. However, I didn't roam much last time and recalled thinking it was deserving of more exploration. For some background the last exploration, we basically were here just to eat and network. It was at a place called the Tin Shed and Josh and I met up with a gal I met through an Acxiom co-worker when I was pursing the Portland job market more vigorously (pre-Eugene living). I'm excited by my return to Alberta Street. There is definitely one end of the street that the newer and more trendy, hippy. The other end was in more need of growth and stores. 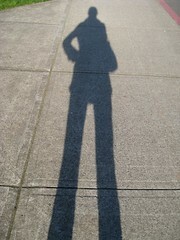 Since it was an absolutely beautiful day, I walked the length of the street . To my dismay, most stores don't open until 11am. Ehh, back to the nicer area and find a place to chill (or plop down, to say it in a fun way) for the remaining time. That brings us here, to this moment of me writing this blog in a free wi-fi coffee shop. Okay, now I'm back home in the evening to finish this off. Before I go on to the rest of the day with Josh, I'll mention Friday (note: today is Saturday). Friday after work and an appointment, Josh and I packed up and headed to Portland. We got into town and checked in to our hotel, Hotel Fifty. We got a great deal on Priceline and it was conveniently located downtown. The trip started off really great with a street parking spot right in front of the hotel - that means no paying for pricey hotel parking. Woot! We threw our stuff in the room (ok, we didn't literally throw, but you get the idea), and headed out for a stroll to uptown Pearl District for dinner. I was very hungry, so we opted on a tried and true favorite, Silk. We were not disappointed. It was a awesome meal of fish and curry. We even splurged on dessert of banana bread pudding with tapioca pudding....melted in our mouths. Tummies full, we strolled back to the hotel via Powells Book store. Josh did some final studying and I did random computer stuff. Back to Saturday before the exam. We had to get up early - ugh, early on a non-work day (boo). Aren't I a dedicated fiancee? We got breakfast at North Star, which turned out to be quite good coffee. That was just a side note since I wanted to mention the breakfast place. Now, back on track. I picked up Josh after he called and we headed back to the awesome coffee shop for lunch. We enjoyed pot pie (Josh) and sandwich-salad combo (Heather). We strolled around the part of the area I didn't quite get to thoroughly. We also got tasty tea at Townshend - btw, we've tried it in Bend before and liked it immensely. So we strolled with our drinks on a sunny day. And if I like anything more than exploring, it's exploring with Josh with me! Heavenly day. Oh, and that's not it. We drove back across the bridge to downtown and hit up the real mall experience and Pioneer Place. How I missed you mall! I got a free mini-facial (with product sales, of course) at Origins. Josh got a Mac Store "fix" and all we well in the world. And I'm still going. We ended the fine day at YoCream. You CAN'T, I repeat CAN'T, go to Portland without a stop for decent, real froyo. I was a bit disappointed in flavors, but I still loved it. After all this, we drove home and here I am. One complaint: I have to open the store tomorrow (aka wake up insanely, inhumanly early). But I I'm going to go watch some How I Met Your Mother and be happy. Pictures to come soon, Here's some as a preview. Perhaps a video (thinking about it & whether my "old" computer can handle it). Perhaps Perhap. Oh, and in case it didn't make send, the song reference on top is because Alberta, and Portland in general, is hippy and it's a hipster type song.